Iberostar Cancun Spa & Golf Resort is a luxurious 5-star All Inclusive complex located on one of the finest beaches in Cancun, Mexico. Located only minutes from Cancún International Airport, this modern family-friendly hotel is great for families, couples and groups of all types. Iberostar Cancun offers luxurious rooms, great service, multiple dining options and some of the best hotel convention facilities in the area. Not to mention, i'ts a golfer's paradise. The IBEROSTAR Cancún hotel is the only resort in the area that has an 18-hole championship golf course. A true delight for fans of this sport..
Iberostar Cancun has also received the prestiguous AAA- Four Diamond Award for it's outstanding quality and service! 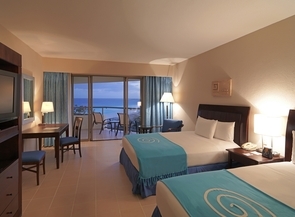 Iberostar Cancun offers a great selection of Luxurious rooms including villas, deluxe rooms and various types of suites. All rooms are spacious, very comfortable and feature luxurious decor. Most of them enjoy beautiful views of the Caribbean, and the suites have a private hot tub on the balcony. All standard rooms feature a full bath, shower, and two queen-size beds. They're equipped with a/c, wireless Internet (extra charge), 3 dua l-line telephone, hair dryer, refreshment center, safe deposit box, 32 inch LCD Cable TV, CD, MP3 radio alarm clock . The Deluxe Standard room comes with or without a balcony. 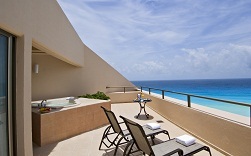 To take advantage of the beautiful views, we highly reccommend selecting a room with a balcony. 16 Junior Suites - all with beautiful ocean Views and a Jacuzzi on the bacony. 2 Queen or 1 King bed, living room area, jacuzzi on balcony, mini bar & coffee service, in room safe, robes and more. Guests of the IBEROSTAR Cancun Hotel will enjoy an unforgettable dining experience in Cancun. This 5-star hotel features two buffets and four a la carte restaurants specializing in global cuisine: gourmet, Japanese, Mexican, and so much more. Meat lovers will be in heaven at the Steak House while the hotel's bars offer some of the best scenes in Cancun to relax and enjoy a drink. - Las Palmas - Lobby Bar. Open 9:00 a.m. to 1:00 a.m.
- Vertigo - Sports Bar. Open 5:00 p.m. to 1:00 a.m.
- Carey - Pool Bar. Open 10:00 a.m. to 6:00 p.m.
- Las Olas - Beach Bar. Open 10:00 a.m. to 6:00 p.m.
- La Perla - Pool Bar. Open 10:00 a.m. to 6:00 p.m.
Shows, dancing, comedy, and endless music. These are just a few of the entertainment options guests will come across every night at the IBEROSTAR Cancún Telón Theater. No matter what you choose, our top Cancún hotel offers the best entertainment offerings for rounding out a day during your marvelous stay at our resort. If pampering is how you wish to spend your days, we recommend a massage from Initium Spa, where the best revitalizing treatments are offered, or bask in the sun along the pristine Yucatán beaches just outside the hotel. Children will have a blast at Lucy's Club with its spectacular waterpark as well as the many daily activities organized by the hotel's professional staff. Golf is one of the most requested sports at the IBEROSTAR Cancún Hotel, which is no wonder, as the resort is just steps from an impressive 18-hole course par 72...yet another one of the many high-end services IBEROSTAR strives to provide its guests. The hotel also features seven spectacular swimming pools, plus a lap pool, a professional soccer field, and two tennis courts where guests can stay in shape and have a good time during their Mexican vacation. Golf - One of a kind, the IBEROSTAR Cancún is the only resort in Cancún's hotel district with a professional Par 72, 18-hole golf course. Golf enthusiasts will love the 260 yards of course, pro-shop, and clubhouse, as well as the numerous perks and discounts.